Maddy Curzon already has three strikes at the Midwest Regionals — in three consecutive years at this event she’s failed to qualify for the NCAA Championships. But the senior sabre is back on the big stage, along with 11 of her teammates, traveling to Notre Dame. Every fencer has one purpose for the meet: Qualify for the NCAA Championships. No. 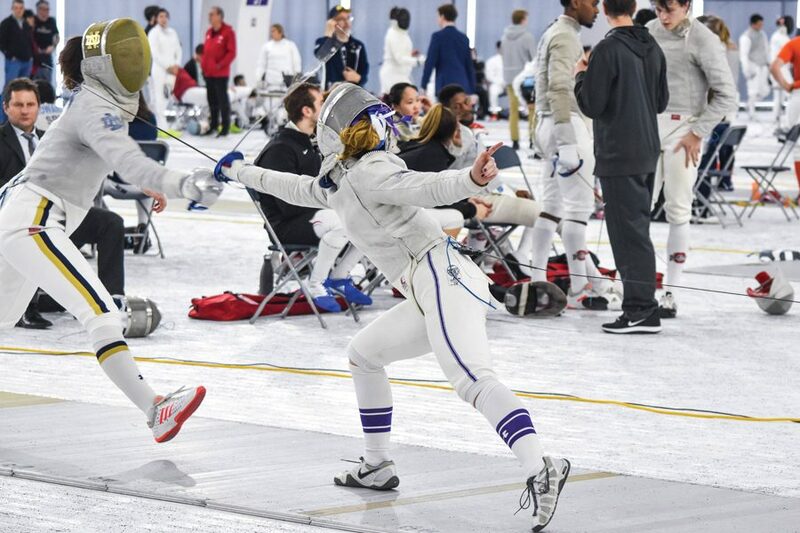 2 Northwestern (39-5) will look to send the maximum two fencers per weapon style on to the next round, but the Midwest’s best fencers stand in the way. The Wildcats are set to face fencers from No. 1 Notre Dame, No. 8 Ohio State and a few smaller programs at the individual pool meet. Coach Zach Moss said he selected NU’s 11 representatives based on their consistency throughout the season, as well as their top results — both Regionals and the regular season outcomes are taken into account for qualification. Curzon, graduate Emine Yücel and sophomore Alexis Browne will compete in sabre. The Cats are sending senior Yvonne Chart, junior Amy Jia, sophomore Sarah Filby and freshman Alyssa Chen for foil, with epées senior Ella Lombard, junior Pauline Hamilton and freshmen Julia Falinska and Maggie Snider rounding out the team. NU’s fencers will face their teammates who use the same weapon style before clashing swords with the rest of their respective pools. The 44 fencers at the meet are split almost evenly among the three styles. Two weeks ago at the Midwest Fencing Conference championships, a team and individual competition, the Cats came away with a team win but no individual gold medals. This weekend, only individual play will take place. “Individual tournaments are not always our strength, but it’s a team tournament couched in individual, and that’s something that we can do really well,” Moss said of Regionals. Filby, who earned All-American honors at last year’s NCAA Championships, is coming off a fantastic regular season in which she led NU foilists with 37 wins. She said Regionals is an incredibly hectic meet, where fencers often don’t know if they’re about to have a lengthy break or fence seven bouts back-to-back. In preparation for Saturday’s format, NU has shifted its practice schedule slightly. Curzon said they’ve been going quickly from footwork practice to intense drills and situational bouts, where they rotate fencing against different teammates without breaks. This style of preparation could work in Curzon’s fourth trip to Regionals, as she hopes to break through to nationals. She placed eighth her freshman year, 11th her sophomore year and sixth her junior year. After the junior year finish, the fencer who’d placed 7th ended up earning the berth to the NCAA Championships because of a better regular season record. Curzon said she won’t give any mercy on Saturday, knowing that every touch in the lightning-fast meet counts. “This tournament, as long as I start on the right foot, I think that back-to-back attitude will only give me momentum,” she said.